New generation digital learning tools could help teachers give their most disadvantaged students confidence and success across the NT’s bush classrooms, according to teacher and recent Territorian Ken Kincade. Test driving e-learning tools at a recent road-show that visited the Elliot Community School last week, Mr Kincade drew upon his teaching experience across Victoria, and more recently at the Territory school, to support digital learning. 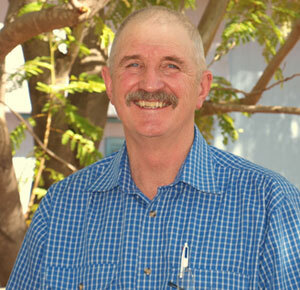 Mr Kincade has been teaching at the Barkly region school for nearly two years. He said e-learning programs that engaged students would help balance the great variance in literacy and numeracy levels within his classes. He said this would boost confidence of the students, many of whom were so disadvantaged that they struggled to learn in a classroom. “But I’ve seen some huge progress made here which has given me great satisfaction to know my final teaching years are put to such good use,” he said. The road-show was co-organised by CDU, NT Department of Education and Training and Darwin-based Industry Services Training. It involved two mobile truck classrooms visiting communities along the Stuart Highway from Alice Springs to Darwin. Character-based animation and NT-developed software, Marvin, featured with a host of other software programs that encouraged local Indigenous stories and ideas to be built within the learning framework. Calling on more teachers in the “twilight of their career” to teach in the bush, Mr Kincade said his two-year experience at Elliot had been challenging and highly rewarding.